Last Saturday, my company of Civil War reenactors participated in “Lincoln Day” in Hingham, Massachusetts. It is probably my favorite annual ceremony. I’ve made it a priority to be there each year since I started reenacting (it happened to by my first public event as a raw recruit some fifteen years ago). The event honors two different Lincolns. First, General Benjamin Lincoln of Revolutionary War fame who resided in Hingham and was Washington’s designee to accept the British surrender at Yorktown. Second, President Abraham Lincoln whose “way-back” ancestors settled in Hingham in the 17th century. The event includes salutes fired by Revolutionary and Civil War reenactors, a very nice ceremony in the Old Ship Church (the oldest, continuously used church in the nation…if you are from the Boston area and haven’t seen this amazing building, put it on your list) and then a march to the statue of Abraham Lincoln on the Hingham Town Green where more salutes are fired. All of the above is very good and I am always pleased to participate. But for me, the most important part of the event is a salute that is something of a ceremonial tangent. For me, it’s all about Governor John Andrew. I’ve mentioned in other posts how Andrew, as Governor of Massachusetts during the entirety of the Civil War, was so effective at preparing the Commonwealth for war, supporting her troops, as well as abolitionism and the Union cause. Not unlike Lincoln, Andrew was exactly the sort of figure Massachusetts needed in a time of crisis. The “worthy monument” over Governor Andrew’s grave, which is indeed a handsome one, was sculpted by Thomas R. Gould (1818-1881). Gould was a sculptor from Boston who spent a great deal of time in Florence learning his art. His best known work is very far away…a statue of King Kamehameha in Honolulu. The driving force behind the monument was Brigadier General Luther Stephenson, Jr., one of Hingham’s Civil War heroes. 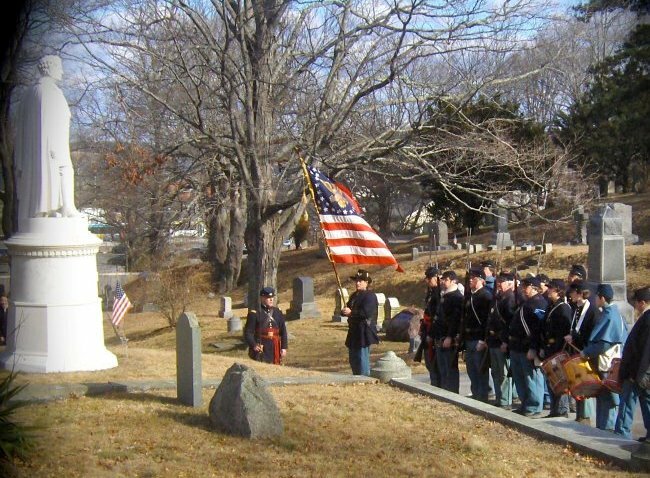 He was captain of Hingham’s pre-war militia company, the “Lincoln Light Infantry,” which became Company I of the 4th Massachusetts Infantry at the beginning of the war. In 1862, he became captain of Company A of the 32nd Massachusetts Infantry, and rose through the ranks to Lieutenant Colonel and the command of that regiment. He was wounded very seriously at Gettysburg, being shot through the face, and twice again during the Overland Campaign in May and June of 1864. He was forced to resign due to his wounds on June 28, 1864. After the war, he was awarded the brevet rank of brigadier general. 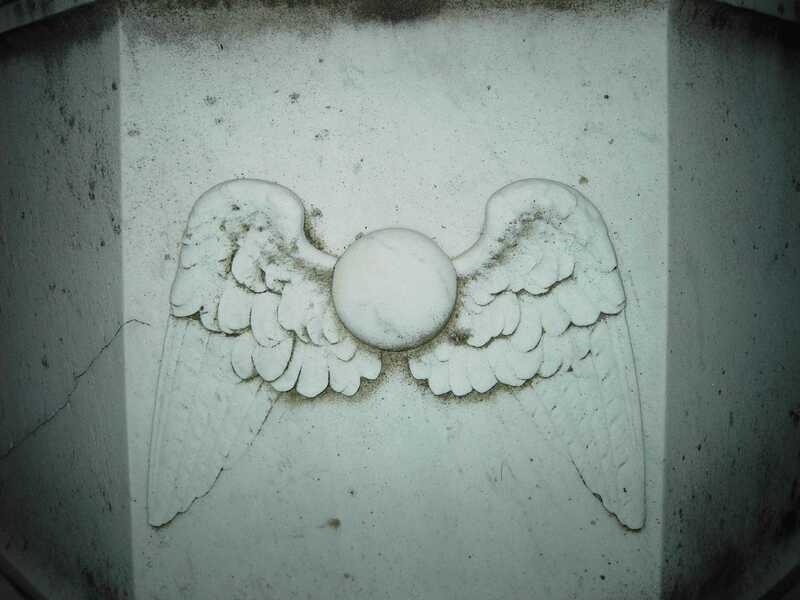 I have always been intrigued by the winged orb on Andrew's monument...an Egyptian symbol of immortality. And the veterans did come by the thousands to pay their respects to the War Governor and reflect on their deeds. But now, 150 years after the war, Governor Andrew is not exactly a household name. And, as people wander the Hingham Cemetery, known for its beautiful memorials, I’m sure that most look on the marble statue, whose base simply reads “Andrew,” and wonder who he was. So, the annual salute organized by the good folks of Hingham on Lincoln Day is very important indeed, even if it is not the main event. And I will always consider it a great honor to render the salute on the same ground where the veterans stood, bowed their heads, and paid their respects.